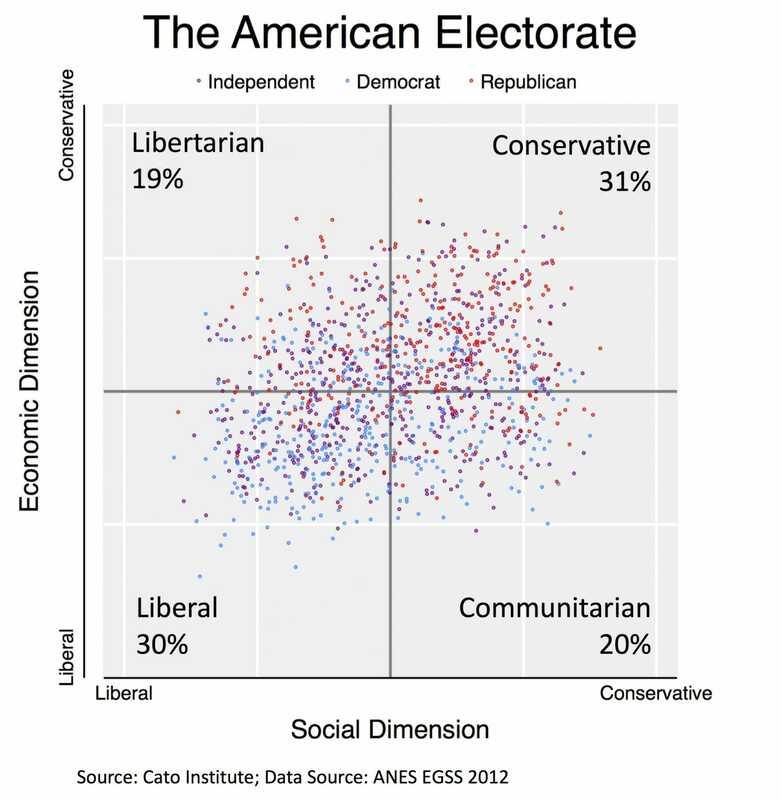 With the proviso that it is super dangerous to analyze this sort of data by eyeballing a scatter chart, it sure looks to me like the difference between Republicans and Democrats is mainly on economic rather than social issues. This is surprising, I suppose, because Democrats and the media focus most of their criticism on Republicans for being social dinosaurs, but it looks like the social issues are not as much of a discriminator. I also find it surprising given recent the Republican affinity for what strike me as liberal economic ideas, including Trump's protectionism and the strong vote for a minimum wage in red-state Arizona. I regretfully invoke my Simplistic Theory of Left and Right. The heart of the left isn't helping the poor, or reducing inequality, or even minority rights. The heart of the left is being anti-market.... The second half of my Simplistic Theory says: The heart of the right is being anti-left. I like the way he puts the last bit, because I SURE would struggle to call modern Republicans pro-market. In this post, by the way, Caplan is skeptical about the feasibility of progressive-libertarian concerted action on certain issues. I know my friend Brink Lindsey is working on a book to be released in the fall which will make a case for such areas of cooperation. I will say from my personal experience that as a libertarian I was able for years to make common cause with the Left on certain issues and on the Right for other issues. I found, starting a couple of years ago when I tried to participate in the leadership of a pro gay marriage effort, that it was increasingly hard for me to work with the progressive Left. To work with me, they demanded not just that I agree with the issue at hand, but that I also had to pass any number of other litmus tests unrelated to the issue we were working on -- ie I could not be allowed to work for gay marriage given that I had expressed skeptical opinions on the minimum wage and catastrophic man-made climate change.